This item works well when used with any Manufacturer's Metered Pedestal or Surface Mount Box. This item will also work with Utility Supply Group's Meter Socket Kit. 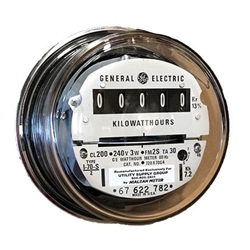 Choose these meters when you have sites fed with 120 volt supply power (one hot wire). These meters can also be used in 240 volt applications. *Not Approved for use in California when used in a single hot wire application.